Are you conscious of how active you are? Trying to get fit, and stay in shape once you’ve managed it? Wearable tech has made it so much easier to track vital stats like our steps, calories, and even sleep. A built-in heart rate monitor lets you assess your own fitness, and spot any irregularities your doctor should know about. What are the best fitness trackers with heart rate monitoring? We’ve rounded up some of the best choices here. Considering an Apple Watch? It’s a great activity tracker that’ll help you monitor your heart rate, while doing so much more. Users can check their heart rate at any time with the Apple Watch using the Heart Rate watch app. Flashing green LEDs on the back of the device feature light-sensitive photodiodes, which detect the amount of blood flowing through your wrist. With this data, the Watch will calculate the number of beats per minute, which is your heart rate. Apple Watch requires a good, snug fit to measure your heart rate accurately. It measures continuously, but you can always check it manually by opening the Heart Rate app. You’ll be able to view resting, walking, breathing, workout, and recovery heart rates. 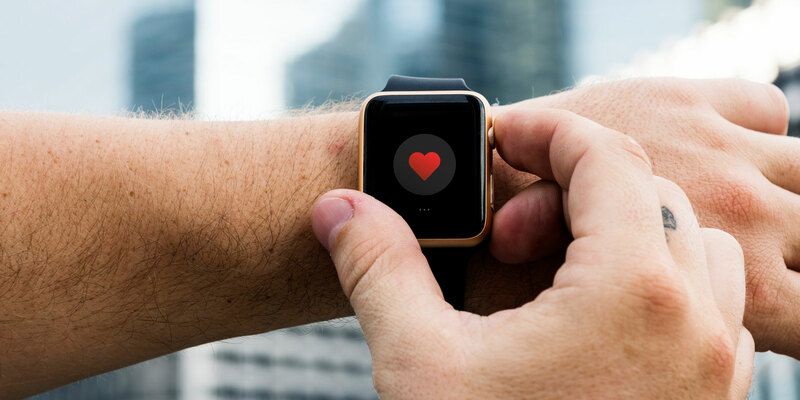 With workouts, Apple Watch measures throughout the session, and three minutes after it ends to determine recovery rate. This information is used to help you visualize how many calories you’ve burned. We have a roundup of great Apple Watch workout apps to help you stay in shape too. Apple claims “all day battery life”, which usually translates to about 18 hours of normal use. The Fitbit Alta HR is a slim and sleek fitness tracker that doesn’t sacrifice function over form. Fitbit’s Alta HR has 24/7 heart rate monitoring with the company’s PurePulse technology, which features the flashing green LEDs on the tracker that detect changes in blood flow. This data is used to calculate your heart rate’s beats per minute (BPM). This is done automatically and continuously; you don’t need to push any buttons or launch any apps to check. The Alta HR also displays your heart rate alongside your step and sleep goals. It also gives you a better understanding of your sleep patterns, as it determines your deep, light, and REM sleep time. All of this data can be viewed in the free Fitbit app (on iTunes and Google Play), which requires a free account to use. Don’t swim or shower wearing the Alta HR, as it is not waterproof! Battery on the Fitbit Alta HR should last seven days on a single full charge. If you don’t mind a little more bulk over the Alta HR, the comfortable Fitbit Charge 3 is the way to go. The Charge 3 has 24/7 continuous heart rate monitoring like the Alta HR, but has some other big features too. For one, it is water resistant up to 50 meters, so you can actually take it swimming, unlike the Alta HR. Its sleep tracking also lets you see your light, deep, and REM sleep patterns through Sleep Insights, so you can see how well you’re sleeping compared to others similar to you. The best feature of the Charge 3 though, is the SpO2 blood oxygen sensor. This helps you detect breathing irregularities, which could help you identify conditions like sleep apnea. The Charge 3 should last about seven days on a single full charge. Find out more in our in depth Fitbit Charge 3 review. If you’re into a wider selection of exercise activities, you should check out the Garmin Vivosmart 4. The Garmin Vivosmart 4 has a heart rate monitor that will track your beats per minute 24/7, but it also does so much more. It includes VO2 Max testing, which is a metric commonly used for HIIT and Crossfit sessions. For the weight lifters, there is Garmin’s Move IQ software and rep counting, which you don’t find in many fitness trackers. The Vivosmart 4 has built-in exercise detection for forgetful minds. So even if you forget to start a workout manually, don’t worry—the tracker will detect changes in your BPM and start logging for you. Like to push your limits while exercising? The Vivosmart 4’s heart rate variability (HRV) stress scores will alert you to take a rest. A “body battery” monitor measures your energy levels to give you insights on how prepared you’ll be for your next intense workout session. Garmin also added a pulse oximeter sensor, which can help you detect things like sleep apnea. Garmin Vivosmart 4 is safe for swimming with and the battery life is around seven days. The Withings Steel HR Sport is definitely a stylish fitness tracker and smartwatch because it resembles an actual watch. With the Withings Steel HR Sport, you get a watch that tracks steps, sleep, and 24/7 heart rate monitoring. The Steel Sport HR also has a VO2 score, which is how efficiently you’re using your oxygen consumption. The Steel HR Sport also tracks swimming activity, and it uses GPS as long as your phone is nearby. There is also sleep tracking, so you can see how you do with deep, light, and REM sleep. The Steel HR Sport boasts incredible battery life, lasting 25 days on a single full charge. If you prefer the analog watch style like the Withings, but prefer to be even more discreet, Garmin Vivomove HR is a good option. The Vivomove HR has a slightly larger digital screen area, so your notifications are easier to read. And the digital screen blends in better with the watch overall, so you only see the digital part when you want to. The heart rate monitor on the Vivomove HR is also excellent, as it does 24/7 tracking, focuses on HRV, and tells you your resting heart rate too. Vivomove HR also tracks runs, strength training sessions, 50 meter swim resistance, and 14 days battery life. The Best Fitness Tracker With Heart Rate Monitoring? These are some of the best fitness trackers with heart rate monitoring available. However, our favorite is the Fitbit Charge 3, an invaluable tool to help you keep in shape. We love that it monitors your heart rate 24/7, even while you swim, up to 50 meters. Plus, it comes an SpO2 blood oxygen sensor, which helps you find out if you have irregularities like sleep apnea. Plus, the Charge 3 is comfortable to wear and lasts around a week on a single charge. With a fitness tracker in mind, you should check out our recommendations on free iPhone fitness apps to help you get on track to a healthier lifestyle.